Elm’s lifestyle and diet is the typical one of most athletes: nothing fatty and with high amounts of fruit and vegetables. She eats an avocado every day, for example. She also loves honey and saves Manuka honey as her treat, eating a big spoonful in her morning porridge. She also gets a lot of sleep, eats dark chocolate, avoids a lot of alcohol, and takes vitamins and other supplements. This diet helps her blow past her competitors. Angela Copson is 69 and attributes her passion for running to her husband, who had life-saving heart surgery and had to take up exercise. She runs for charity and medical research marathons. She eats healthy food, but she does not deny herself anything she wants to eat like most runners do. She loves fish, greens, and brown rice, and she takes supplements. She also eats honey in her porridge just as Elms does and always gets a good night’s rest. Our last runner is Kate Williamson, who is 70 and holds the British record for the Virgin Money London Marathon, which she ran in three hours and 42 minutes. Williamson loves to run and trains four or five times a week, but she also does it for enjoyment. 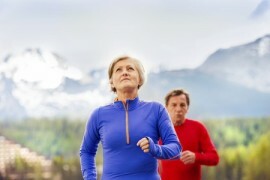 She recommends certain things for older people looking to start training for marathons, “Obviously, for longer races, the long runs are important, but I think speed work including hills is essential. I also think stretching is important. I also love to cycle, walk, and work in the garden.” As on the nutrition side, she is not into self-denial. She doesn’t take supplements, drinks moderately, and loves all food, especially bread and fruit. If you are in your mid-life period and are looking to start running, try following these women’s wise tips and tricks of the trade!